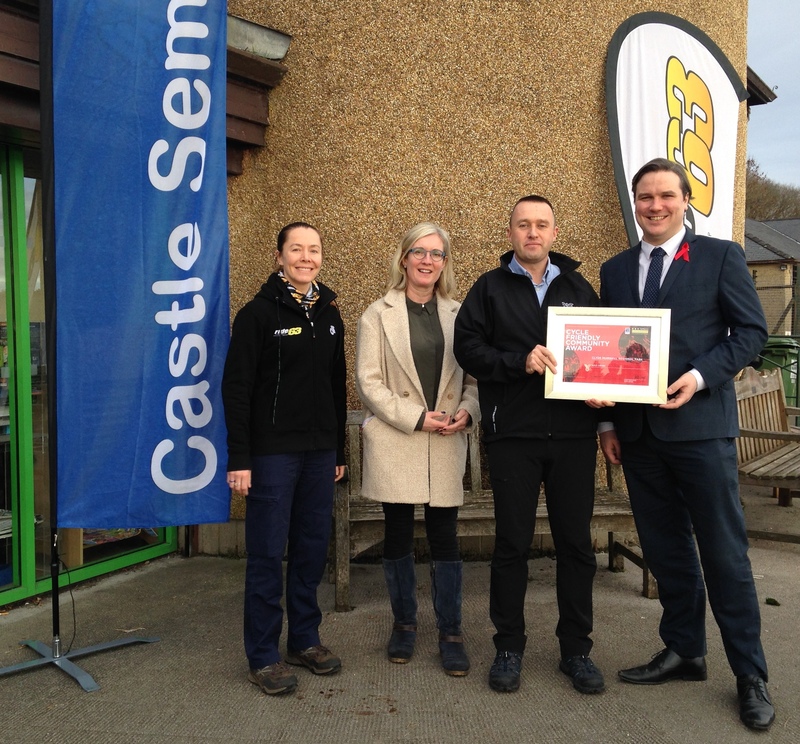 Top Community Cycle Award for CMRP. Clyde Muirshiel Regional Park and partners Ride 63 Community Cycling Club, have been awarded the GOLD level Cycle Friendly Community Award by Cycling Scotland. The Award recognises the wide range of cycling that goes on in the local community and how Clyde Muirshiel has encouraged and developed this. In order to meet the conditions for the Award at Gold level, the Park has over the past few years undertaken a wide range of cycling related activities. These have included training new cycle ride leaders, acquiring a wide range of adapted bikes, delivering adapted bike sessions to local special schools and completing studies on active travel enhancements as well as investigating the potential for more off road bike routes. The photograph shows Kath Brough, Behaviour Change Manager at Cycling Scotland and Tom Arthur MSP for Renfrewshire South at Clyde Muirshiel’s Castle Semple Visitor Centre, Lochwinnoch presenting The AWARD to David Hill, Senior Instructor at Clyde Regional Park and Claire Devlin Secretary of Ride 63. Kath said: “The Cycle Friendly Community Award recognises the leading role taken by communities in developing and increasing the numbers of people cycling within the community. Clyde Muirshiel Regional Park has done exceptionally well in planning & strategy, governance and delivery. David Gatherer, Regional Park Manager said: “It is always rewarding when Park staff received recognition for their efforts. However we don’t stop there, our next cycling event is ‘Ride About A Bit’ on Saturday 30 December from Castle Semple Visitor Centre. Various rides depending on the weather and social activities are in the planning, more details can be found on the event page of the Park website.